As my friends in India were lighting lamps for the Diwali holiday recently, people in Croatia and other parts of Europe were lighting candles for a different type of holiday. 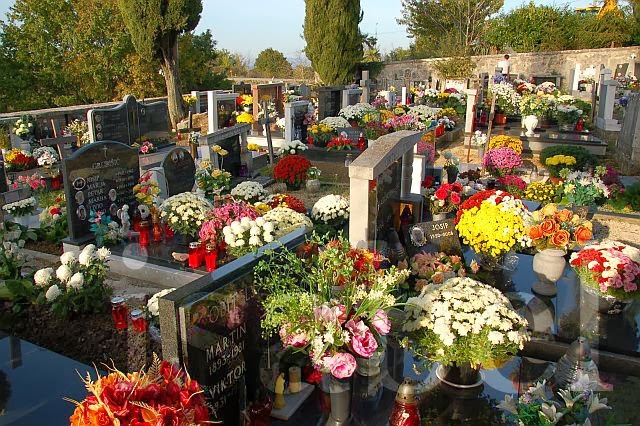 November 1st is All Saints Day, a day to remember family members and loved ones who are no longer with us. This is a national holiday in Croatia as well as in many other European countries. 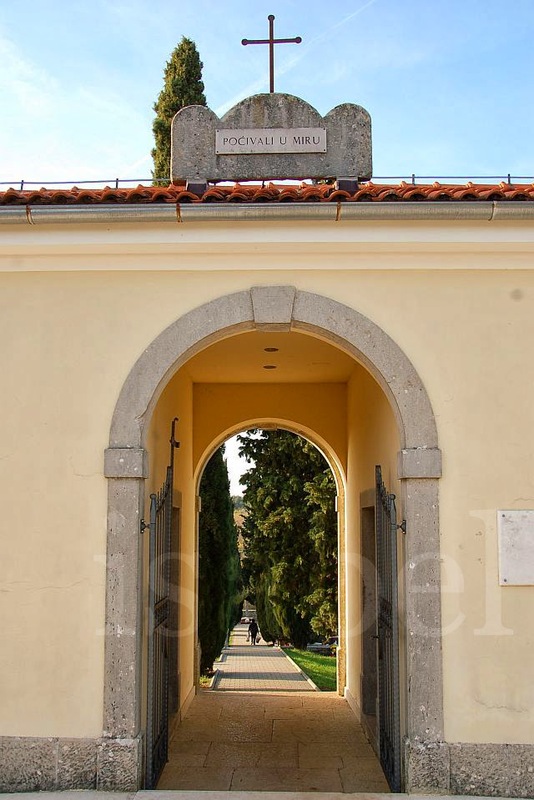 My grandparents, great-grandparents and other extended family members are buried in the cemetery in Gračišće. 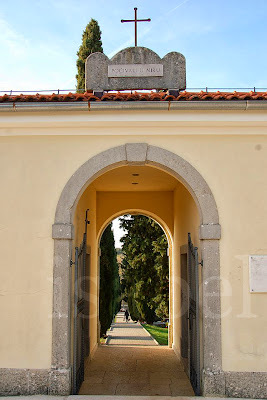 Cemeteries in Istria are usually located separate from the village and many have tall, evergreen cypress trees. In Gračišće the cemetery is located across the road from the old village in ‘new Gračišće’ with a view of the hills beyond. 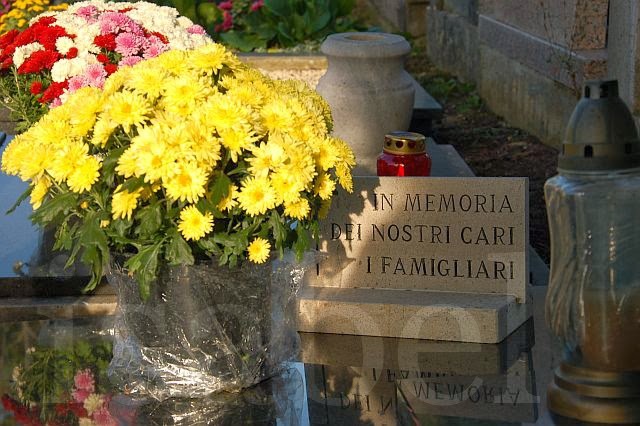 After my grandparents passed away, I would always go to the cemetery first whenever I came to Istria, to pay my respects to them. My father would usually accompany me. We’d first go see the graves of his younger brother and sister who died as infants, which was common in the days when infant mortality was high in many parts of Europe. As we would make our way through the graveyard, he would tell me stories about the people he had known who are buried here… a young girl who had died of polio, an electrician who had fallen from an electrical pole, a young man who was accidentally shot while cleaning his gun during military service. On the day before All Saints Day, the cemetery was already full of people tending to their relatives’ graves: sweeping away old leaves and debris, laying fresh flowers and lighting votive candles. The graves were covered in a sea of flowers and there was a smell of burning plastic (from the candles). My grandparents’ graves were already neat and tidy and laid with fresh flowers which meant my aunt had already been there. On the morning of the holiday, there were cars parked everywhere around the cemetery as people came to honour their ancestors and attend mass at the church. After mass, families assembled next to the tombstones of their relatives as the village priest led a few prayers for the departed and then sprinkled the congregation and graves with holy water. This is a somewhat sombre religious holiday, but also a day when families get together to remember their ancestors and share a meal together afterwards. When I passed by the cemetery at night, it was a sea of red lights flickering in the dark – a solemn but beautiful sight! Dear Isabel, I have been following your blog from India days. Being in Bangalore, I was able to get a different view of my city, through your blogs. Glad, that your good work is being continued in Istria. I liked your post, especially the one on the Post-office in Gračišće. All saints day is similar to "Mahalaya Amavasya" in India, where we respect our elders, who have left us. We remember, the elders, the infants, all relatives, Servants, Masters, Teachers and all those, whom we need to pay respect. Hi Prashanth, thanks for following me all the way from Bangalore to Istria! In India, there seems to be a special day to honour almost everything and everyone. That's one thing I found fascinating: there was something special to celebrate almost every day.